Can't believe it, really I can't. Almost 4 years between posts, is that some kind of record? not a good record mind you. A number of QDU members have decided to band together to support one another on a Free Motion Quilting Extravaganza journey, and a blog, while not necessary, is suggested, so, back to blogging about stitching. Of course one could have started another blog entirely to follow - bit of a toss up here - time spent setting up a new blog versus the embarrassment of fessing up. You guessed it, I'm a bit time poor at the moment, in fact if spare minutes were $$'s you would call me destitute. Funny thing about getting active on this blog again, there is a link in my sidebar to Leah Days blog from her very early days, that discovery sent me of on a search for work samples and these came to hand. Pretty easy to see why I slacked off. 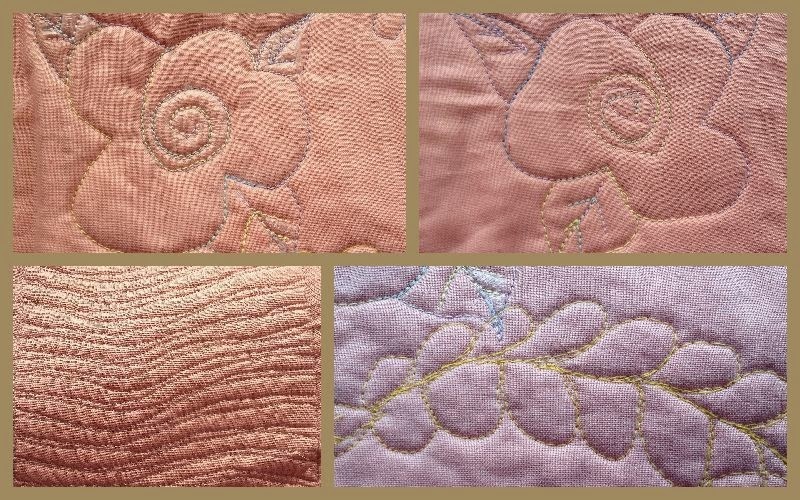 The bottom left is supposed to be Leah Day's waves, using neutral thread in the bobbin and black on the top, this was suggested to help with tensions, the idea being one made a note on the quilt sandwich of what the tension was set at and whether or not a F.M.Q bobbin or blue bobbin was used, no notes on my sandwich.....oh dear! The last pic is of an attempt at feathers. So now off to visit two suggested sites Leah Day's 365 days of quilting and Christina at A Few Scraps. and think about what I will post as my target and whether it will be a fortnightly or monthly challenge for me. 4 years is indeed a long time! Merry Christmas Chick, and a Happy New Year.